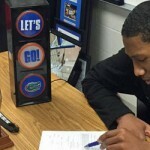 College’s basketball’s early signing period began Wednesday, and the Florida Gators expect to receive National Letters of Intent from three of their four 2015 commitments – four-star power forward Noah Dickerson (Montverde, FL), three-star PF Kevarrius Hayes (Live, Oak, FL) and three-star small forward Keith Stone (Deerfield Beach, FL) – before that period is out. Florida is not sure, however, when it will be given an NLI from its highest-rated pledge, four-star guard KeVaughn Allen (Little Rock, AR). The Arkansas Democrat-Gazette first reported Tuesday that Allen “will not sign during the early period and will hold off until the spring to sign,” despite planning to remain committed to the Gators. Though he has been committed to Florida since April, Allen has continued to be pursued by other programs including his home state team, Arkansas. 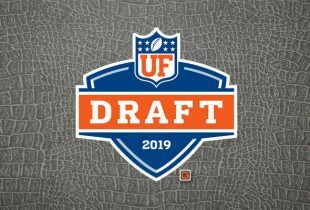 A source close to the Gators told OnlyGators.com on Wednesday that the staff still believes that Allen will send in his NLI by the end of the day Thursday. A second source was less confident, noting that the situation is shaky and may not fully play out until the regular signing period in the spring. As of two weeks ago, Allen was still singing Florida’s praises during an interview with CBS 11 out of Little Rock. “One thing about Florida that I fell in love with is the coach. Coach [Billy] Donovan, he’s is a real good coach. He’s a cool coach. On practice days, he’s just after you, just not letting you breathe,” he said. Ranked No. 63 overall in the Rivals 100, Allen is Florida’s highest-rated 2015 prospect. Dickerson (whose NLI was received by UF on Wednesday) checks in one spot later at No. 64 with Stone and Hayes a bit further down at Nos. 128 and 139, respectively. During his Monday press conference, Alabama head coach Nick Saban discussed the quarterback he is facing this weekend, Mississippi State’s Dak Prescott. Prescott has drawn comparisons to Tim Tebow – in large part due to how Dan Mullen uses him in MSU’s offense – and Saban acknowledged that, with a caveat. “Dak Prescott is a very talented guy in a lot of ways. He’s a big, physical runner and kind of reminds you of Tebow in a lot of ways, but he’s also a very, very good passer,” he said. And in case you’re wondering how Tebow played against Alabama…he completed 35-of-58 passes (.603) for 486 yards with four touchdowns to one interception. He also rushed for 148 yards and another score. …and while Saban may not like Tebow or think he’s a good passer, one Alabama resident and Tide fan apparently shares a different opinion. 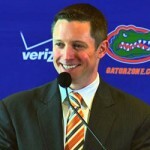 During an interview with CampusInsiders.com, Mullen spoke extensively about his relationship with former Gators head coach Urban Meyer and discussed why he believes Meyer ultimately left Florida. “At Florida, I think we put it into a position where winning was no longer fun. Winning was a relief. Losing was the greatest disaster that could come upon you. There was never a joy aspect to it anymore at the end at Florida kind of before I left. And then the next year, I think the pressure started to build and build. You could see it. I think for him also a lot of the guys that had been with him for quite a while had that opportunity – as I had – to move on. When you kind of build something up and your security guys are there and then you turn and they’re not there, it gets difficult. Mission Belt: Review, caption contest! Last week, the good folks at Mission Belt Co. – perhaps you remember them from Shark Tank? – sent over a tremendous care package including their brand new Florida Gators belt buckle, a black leather belt and an additional Black Magic buckle, all of which I have been trying out over the last week. 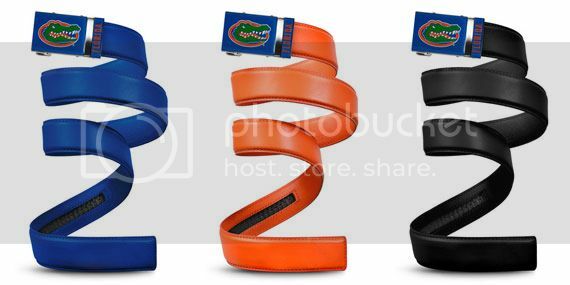 I gave them an honest, sterling review – it really is a great product – and announced that we would hold a caption contest for a great prize from the company – a FREE Florida Gators Mission Belt (up to a $59.95 value) in the winner’s choice of size and color. Well, hundreds of submissions were received, and we have finally picked a winner. Be sure to check out Mission Belt Co. on Twitter, Facebook and Instagram. Though our last contest was more than a year ago, OnlyGators.com has given away cufflinks, digital picture frames, boom boxes, DVDs, Fatheads, card games, rugs, purses, books, artwork, towels, razors, scarfs and scented warmers since 2009. Hopefully you can be a winner next time! Most basketball players focus on nabbing a multi-million dollar shoe deal. For Dallas Mavericks forward Chandler Parsons, it looks like the ability to design his own line of CP25 socks was too good to pass up. I’ve been on a bit of a theater-going binge over the last few Thursdays. Last week, I went to see Interstellar, a film receiving a ton of acclaim but also a bunch of criticism since it was released. First, let me tell you about my theater experience. For the first time since The Dark Knight, I traveled 40 miles to see this movie in 70mm IMAX. It was well worth the trip and expense to watch a movie of this quality shot with 70mm film on a projector that takes full advantage of the technology. And it’s not just about the size of the screen but also the quality of the picture and the immersive experience with incredible sound. Not that he ever has before, but Christopher Nolan spared no expense on this film. The cinematography was incredible, as was the direction, casting and acting. Where many have raised qualms with the film – don’t worry, no spoilers here – is with its science. The problem with those critics? They’re forgetting the movie is science fiction. As with any film, there are plot holes and questions that can be raised – such as how one thing is possible yet another is not – but in the end it is worth remembering that movies at their base level are entertainment. Nolan went out of his way to hire a top-notch consultant for the film, and the consultant even went so far as to release a book explaining the science behind Interstellar. Nevertheless, Nolan made it known from the get-go that the movie’s science – especially pure theories about the unknown – could not be followed to a T.
Interstellar is, well, stellar. It’s a must-see in theaters and a should-see in any premium type of screen you may have available to you (whether Cinemark XD, IMAX or, preferably, 70mm IMAX). Mullen and only Mulllen, not Gator Nation, is responsible for feeling “winning isn’t fun anymore” if he actually felt that way. Remember, he was the guy that chose to come in and call plays in a game the day after an emergency appendectomy. Dude could have sprung a leak in that coach’s box and died. I haven’t read interviews with former Gator players who said winning wasn’t fun. They think losing isn’t much fun. – excellent choice on the winning comment! – If Meyer had said what Mullen did when he left, and been honest, he wouldn’t be so reviled by Gator fans today. Like they say about Watergate and many of the current scandals – it isn’t the crime that gets you in trouble, it’s the cover up. – Why does the source think that KeVaugn signing is shaky? Unless there is another school that is pursuing him that he would prefer to go to, everything else points to no reason not to sign? Interstellar is hot garbage. The story itself is dumb beyond words, and this comes from a HUGE sci-if fan.